I just broke open this bottle. 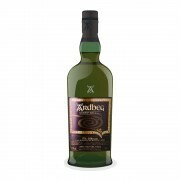 I have to admit I haven't had much experience with the Islay whiskys. I have only had the Lagavulin 16yo thus far. First the nose... waves of smoke as I had expected. I added a few drops of water, but I don't think it made much difference. This whisky has an intensity that just doesn't quit. As I write this, it is some hours later and I can still feel the smoke permeating my body. I did like it, but I think I need to work up to it as a regular whisky in my lineup.